Have HVLS Fans Changed NFPA 13? High Volume Low Speed (HVLS) fans are a great addition to any large facility or warehouse. They are an energy efficient supplement to expensive HVAC systems, moving large amounts of air helping employees stay comfortable and productive. As a growing number of facilities are now incorporating these fans, fire protection engineers are concerned about their effect on sprinkler system operation. Many experts fear these fans will delay sprinkler operation, possibly overwhelm the sprinkler system, and cause a larger fire than necessary. New research has focused on addressing those concerns. 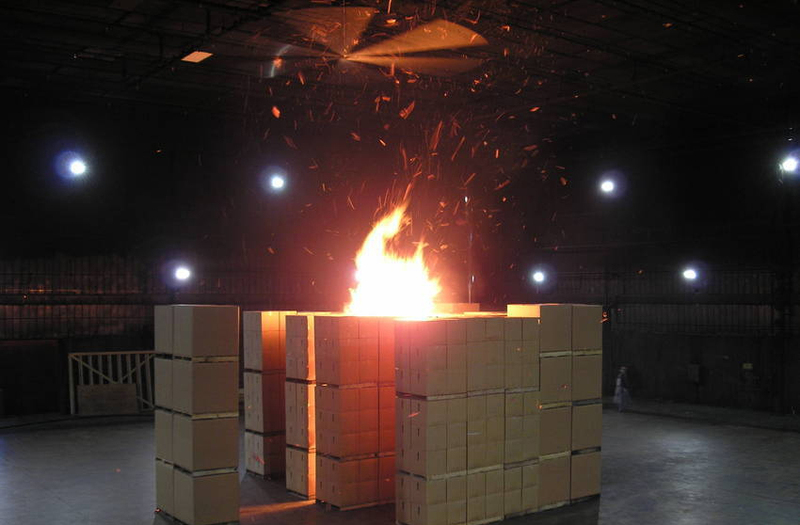 While it is known that high airflow makes a fire more intense, it has taken some time to understand the impact these HVLS fans have on sprinkler performance in warehouses and other storage occupancies. The Fire Protection Research Foundation directed a collaborative industry research effort to study the issue and provide direct input to update the applicable NFPA standards. This two-part project was awarded the 2012 Fire Protection Research Foundation medal by NFPA. The report from the most recent study was issued in January 2011. The central problem uncovered during the study and fire testing was the unnecessary fire damage that occured when the fans were not shutdown. The study showed sprinklers will activate while the blades rotate and the down-flow of air increases fire damage to contents requiring more sprinklers to operate to control the fire. Fire test results showed less damage when the fans were shut down upon sprinkler activation.The research results are guiding new code requirements within NFPA 13, the Standard for the Installation of Sprinkler Systems. The 2013 edition of the standard will be issued next year. NFPA technical committee documents indicate that the following code changes will be issued for sprinkled warehouses with HVLS fans. Maximum allowable fan diameter of 24 feet. Fans must be approximately centered between four adjacent sprinklers. There must be a 3 foot minimum clearance from the sprinkler deflector to the fan. Fans must be interlocked to shut down immediately upon receiving a water flow signal from the fire alarm system. These requirements will be placed in the NFPA 13 chapter on storage occupancies. Undoubtedly, there are other types of occupancies where HVLS fans are installed; however, all indications are that the code will not address those locations in the new edition. If you have further questions about the effects of HVLS fans on sprinkler systems, information regarding NFPA 13 or industrial fire suppresison, click here to Ask the Experts at ORR Protection Systems.